This delicious vegan fettuccine alfredo is my go-to meal when I’m cooking for a group of people. Not only is it super easy to make, but even picky eaters and skeptics of vegan food love it. Everyone is usually surprised that there’s no cheese in it, since the nutritional yeast and cashews create a convincingly cheesy taste and texture. I usually add kale, because kale goes fabulously with the sauce, but you can sub with any of your favorite vegetables. 12 to 16 oz fettuccine pasta. I like Tinkyada brown rice pasta. Cook the pasta in a big pot according to directions and put to the side. This can be done while you’re making the sauce. Add the cashews, water, white wine, nutritional yeast, brown rice flour, sea salt, onion, garlic, and 1/4 cup olive oil to a blender. Blend on the highest setting until until smooth. Put the kale in a bowl, add 1 tbsp of olive oil, and massage oil onto the leaves. Heat alfredo sauce over low heat until it thick, about 5 minutes. Add a few pinches of sea salt to taste. 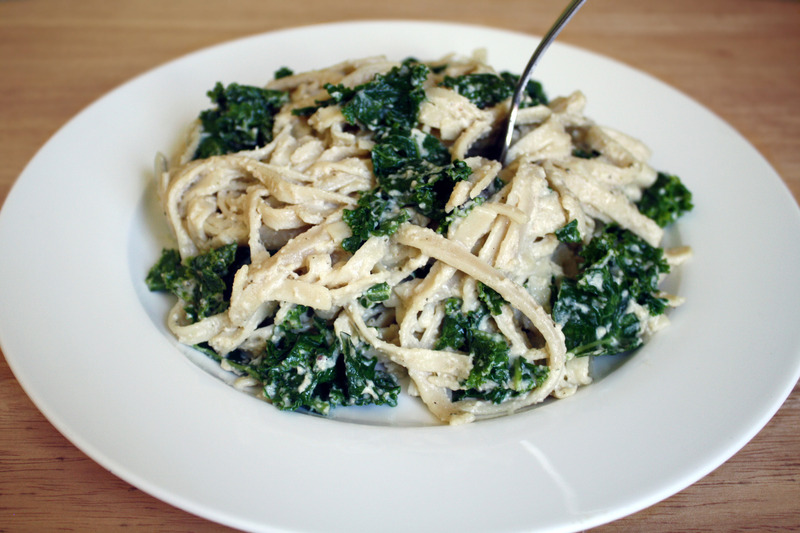 Once the pasta has been cooked and drained, return to pot and top with the kale. 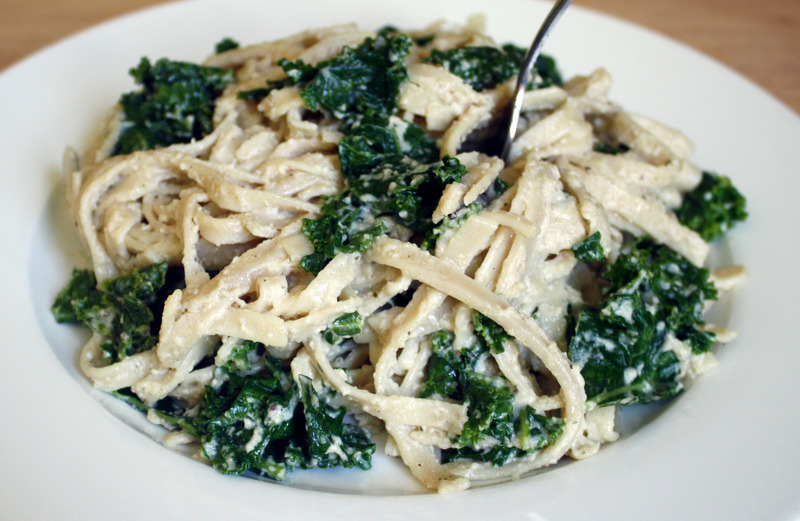 Pour the sauce over the pasta and kale, and mix well. Garnish with ground black pepper. Fettuccine with vegan alfredo sauce, featuring cashews, nutritional yeast, and white wine. Delicious crowd-pleaser! Add the cashews, water, white wine, nutritional yeast, teff flour, sea salt, onion, garlic, and 1/4 cup olive oil to a blender. Blend on highest setting until smooth. Heat alfredo sauce over low heat until thick, about 5 minutes. Add a few pinches of sea salt to taste.